Brush and branch piles are unpleasant and unsightly when you find them on your property. 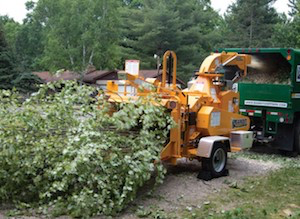 we can dispose any debris from trees and shrubs quickly and at an affordable price. Large tree debris can be difficult to dispose even if you have power tools. It’ll take so much time and effort that would seem like it won’t end. It’s best to hire a professional tree care company to finish the job faster. A woof chipper is used to dispose piled of brush and wood debris. It’s possible to rent a wood chipper. But, the rental cost plus the cost of the truck that will collect wood chips is just too much. You’ll only be wasting too much money that you could have avoided in the first place. In addition to the costly rentals, operating a wood chipper can be dangerous. You’ll need eye and ear protections to avoid causing damage to yourself. To save you all these troubles, call our tree care company. We will visit your property once you’ve given us a call. We’ll assess your situation for free and we’ll give the estimation verbally followed by an email. We will not only eliminate all tree debris. We’ll also clean up your property leaving it in a restored condition. We will not only get rid of your tree waste, but we can also transform mulch and wood chips for your landscape. If you don’t want them, we can haul them away from your property without additional costs. Don’t waste time and money, contact us and we’ll do the hard labor for you at a reasonable price. You can also call us for other tree care services like, tree removal and stump grinding. Brush clearing is needed for new home and office building sites. Limbs, branches, and leaves are some debris that needs to be removed if there are many trees and brush on your property. You can be sure that your residential or commercial property will be cleared of brush if you choose Dinah Tree Service. Your property will be presentable for celebrations and other outdoor activities. Brush can be cleared in several methods. We use different methods and tools depending on the severity of the problem. One of the tools we use is the brush trimmer which clears any house of unwanted plants, brush, and debris. It’s essential to remove brush surrounding your house. Brush that surrounds your house can be unsightly and can severely depreciate your home’s market value. To remove frustrating brush and weeds, contact us. A certified tree care specialist will visit your property to evaluate your land when you contact us for brush removal service. He will discuss with you the requirements needed for removing and clearing brush and other debris on your property. We will give you an estimate verbally followed by a written quote that will be sent through email. You can be sure that you will receive quality brush clearing service at an affordable price. Contact us to finally rid your house and property of weeds, vines, and brush.